Colin Sensei with some of our Black Belts after completing his final training session before returning home. Last week Colin Sensei, the head instructor from Seito-Shito Ryu Phillips Dojo in NSW came to train with us. It was a busy week which involved intensive training one on one with Mike Shihan as well as attending all of our scheduled classes from Monday to Saturday. 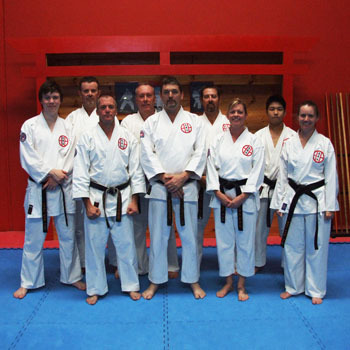 It was a great opportunity for everyone to meet Colin Sensei who has been an affiliate member of Shito-Ryu Australia Karate-Do Kai for the past 18 months and who has established Dojos' in Bathurst, Lithgow and Portland. It was also a good opportunity for Colin Sensei to work through the official curriculum and kata of Shito-Ryu Australia Karate-Do Kai in person with Mike Shihan. With the help of Colin Sensei, Seito Shito-Ryu is continuing to grow and spread in Australia and this year we hope to have 250 members.